I am not a big fan of the Red Cross. 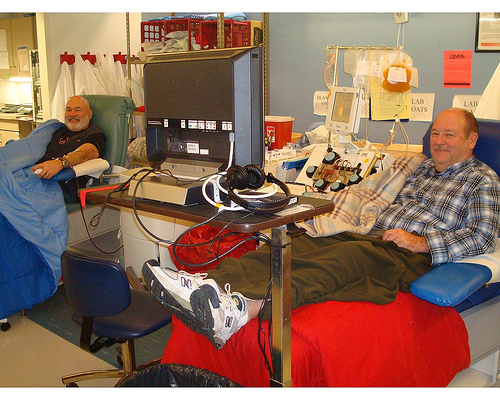 These two men are platelet donors. “During a platelet donation, a small portion of your blood (about 1/4 pint at a time), is drawn from your arm and passed through a sophisticated cell-separating machine. The machine collects the platelets and safely returns the remaining blood components, along with some saline, back to you. After the donation you can resume your normal activities, avoiding heavy lifting or strenuous exercise that day. Many patients who need platelets are undergoing chemotherapy or organ transplant and have weakened immune systems. A platelet dose from a single donor reduces the patient’s exposure to multiple donors and is therefore preferred by many physicians. Think about donating. Ask about donating platelets. If you decide to donate platelets, they will test you. If you qualify, plan on spending three hours or more. They have Netflix so you can watch the movie of your choice.